A wonderful two days in the Sierra! 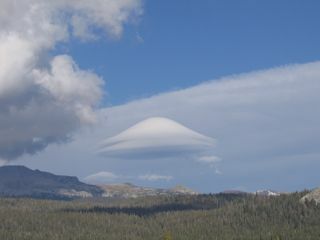 I spent two hours on Pothole Dome in Tuolumne Meadows watching stratiform lenticular clouds form over Mt. Dana and Mt. Gibbs and measured 35 mph winds at Ellery Lake. The next day I had a wonderful hike up the Sierra Crest via Saddlebag Lake. Although my destination was Mt Conness, the icy conditions on the crest made it too dangerous (at least for a wimpy hiker like me) to proceed. Yet my inability to reach the summit didn’t mar the beautiful day one bit. Blue skies, 60F temperatures and a rainbow of oranges, browns, and reds of the fall landscape made for a perfect hiking day.